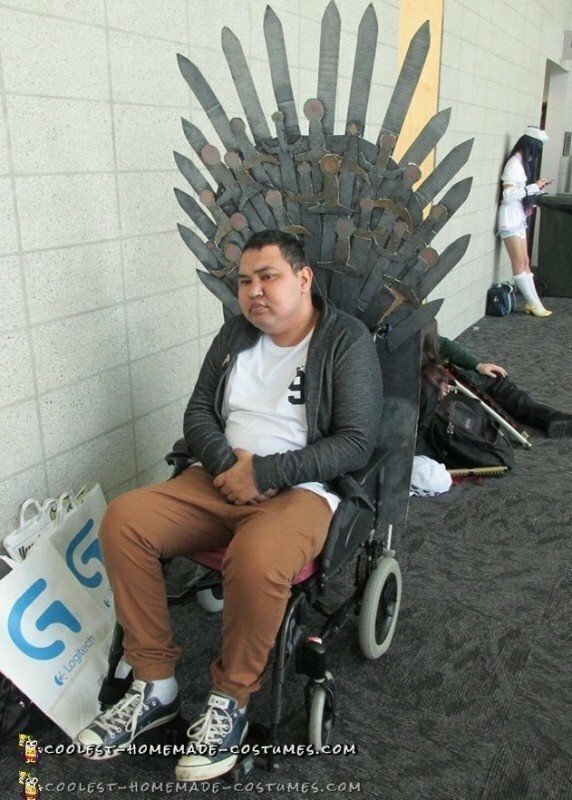 Here’s how we came up with this DIY wheelchair costume. There was one week till our New Zealand version of Comic con and I asked my husband if he wanted to dress up. It would be our first time there with him in his wheelchair as his legs weren’t able to walk long distances. 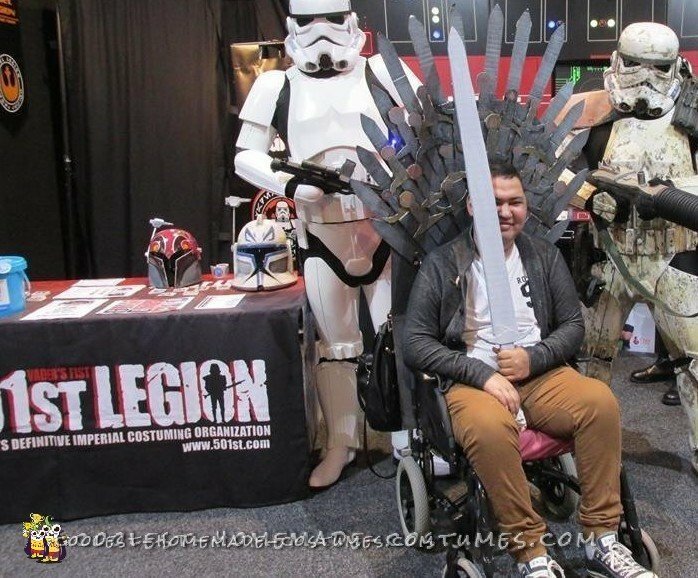 I was inspired by Mica Bethea’s Wheelchair Iron Throne costume at MegaCon 2015. So I created something similar for $0! We have a supermarket in NZ called PakNSave and they put all the cardboard boxes where you pay for your groceries and you can take as many as you want for free! People use it to take shopping in instead of plastic bags. So that definitely kept costs down. Everything else I already had but if you had to buy it it wouldn’t cost much at all! Altogether this costume took 1-2 days. Maybe 6 hours but that’s cos I didn’t really know what I was doing so I was mucking around. Before we start I just want to say that everything was really just me winging it cos this was my first costume I ever created for a wheelchair. 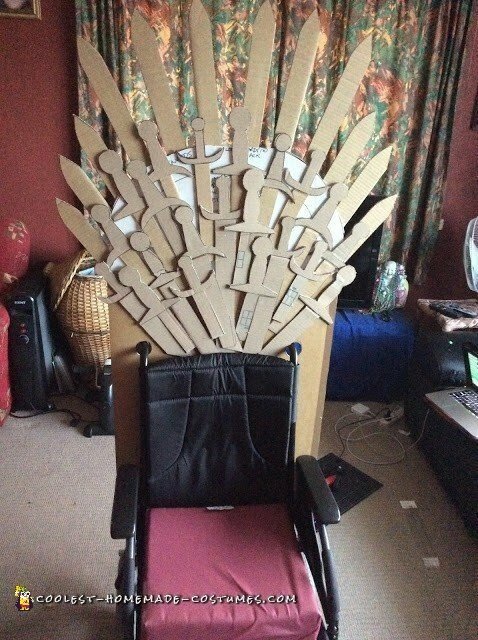 Plus if you do try it it doesn’t have to be perfect because the Iron Throne is made up of so many different swords that people wont even be able to tell if there are any mistakes! I found a big piece of cardboard from my brother’s birthday party and my sister had an old art board (Strong card). I used that for the base. If you don’t have a big piece of cardboard I’m sure you could use masking tape or duct tape to create a strong base. I had the top part cut like a semi-circle so that I could have the swords fan out. I put the cardboard base against the wheelchair and cut circles where I thought the handles would fit. CAUTION: I didn’t get my husband to sit in the wheelchair so it wasn’t as wide as it would be when someones sitting in the chair. I rested the card on the wheelchair flip up brakes. It was quite a high piece of cardboard. DOUBLE CAUTION: I didn’t think about how I would have to push him around so the card ended up being a bit too high but we managed alright. 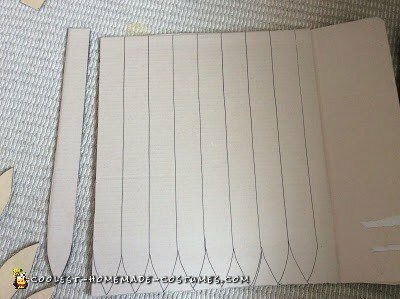 Then I created a stencil of a blade for my swords with a ruler. 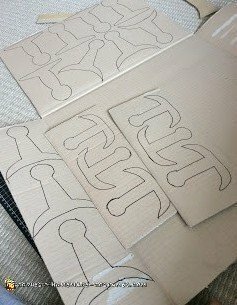 I then used that stencil to cut out 15- 20 swords. The boxes I used were corrugated cardboard but I didn’t mind that because 1. IT’S FREE and 2. It made it stand out more and look a bit more 3D. 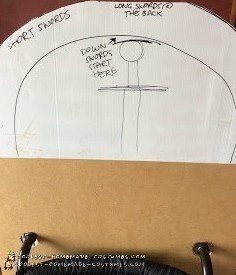 I then made a stencil of a longer sword and made about 15 sword blades to create a fan like shape for the top of the throne. 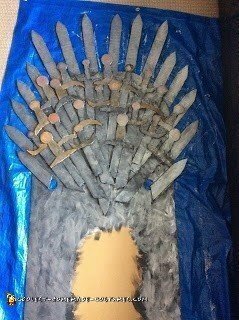 Now for the sword hilts I had 3 different stencils so that it looked like different shapes because the Iron throne is made up of many different swords. 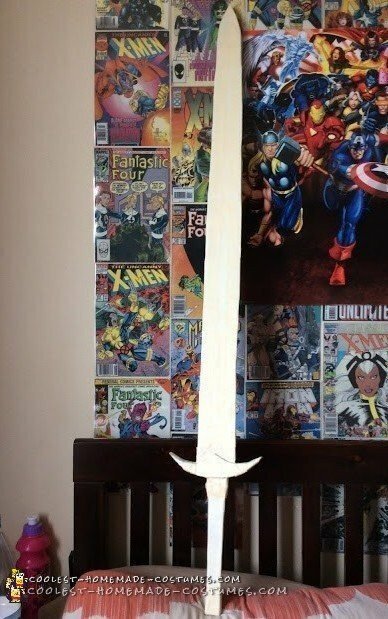 I created a formation of how I wanted the swords to look on the ground next to the base and tried as best as I could to transfer that pattern onto the base using hot glue. Sometimes it was hard cos my glue gun is a cheap little thing. The glue was practically dry before I even stuck it down! I overlapped some of the swords to make it look all messy and random. Now came the painting! I painted everything a dark grey (apart from some sword hilts that I painted gold/ yellow with colored jewels). I also had some left over silver metallic face paint that I manage to patch on. Using a small amount on my brush and dabbing it on, it worked alright and gave the whole thing a very iron looking finish. And that’s basically it. It was easier than I thought it would be. The other thing I didn’t think about was transporting this DIY wheelchair costume! I folded the bottom half of the card base because I figured no one would see the bottom anyway. Thankfully, it all fit in my boot with his wheelchair. When we got there it was really windy so some of the swords bent back but it was all good once we got inside. When I put the costume on his chair I was freaking out because it was too short but I pulled the card and it just managed to work! We always have my husbands backpack (kinda like a baby’s bag with food, clothes, wet wipes, etc.) and I put that behind the costume hanging on the handle bars so that the weight of it kept the costume in place. And no one really saw the back of the costume anyway because I was pushing the wheelchair all the time. Armageddon was great. People were stopping us while we walked asking for photos. They were also coming up to my husband saying that they loved the costume. Even when we walked inside I could hear people say they thought it was smart and creative. People dressed in GOT attire would come and kneel in front of him. I also made him Jon Snow’s sword Long Claw because I thought it would look cool. I tried to get the measurements to scale and that also cost me $0. It made my husband feel like a celebrity and I felt happy about this DIY wheelchair costume. There was a time where he didn’t want to admit that he needed a wheelchair and now he depends on it. It makes me proud to see my husband so happy and making new friends over a costume and a shared love for a fandom.